It was no secret that Huawei was going to introduce the new Huawei P20 and P20 Pro smartphones at its media event today. However, we didn't know that a third, even more advanced smartphone was to be shown as well. 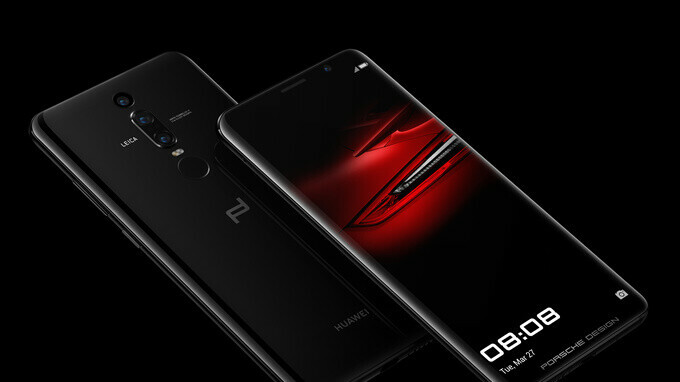 Introducing the Porsche Design Huawei Mate RS – one of the most sophisticated, yet most expensive smartphones announced so far. Think of the new Huawei Mate RS as a Huawei P20 Pro on steroids. It comes with the same Kirin 970 chip, the same 4000mAh battery, and the same triple camera setup at the back, including a huge, 40MP image sensor. But the fancy, 6-inch OLED screen has been curved and has a fingerprint reader built right into it. On the inside, Huawei has also packed fast wireless charging and what it calls microcapsule PCM cooling tech, as well as 256 or 512GB of built-in storage. The phone comes in either black or red. As it is clear to see in the pictures below, Huawei has added a second fingerprint scanner on the Mate RS. Positioned at the back, it can be used to unlock the phone or launch a secure area of the phone's memory for your private files. Meanwhile, hovering a finger above the reader built into the display will wake the phone in case you just need to take a peek at your notifications. Pricing for the Porsche Design Huawei Mate RS stands at €1,695 for the 6GB RAM+256GB storage model. Bumping the capacity to 512GB will bring the figure to €2,095. The red model is set to launch in mainland China only. O... MY.... HUAWEI has sent some earthquakes through the android ecosystem. in regards to national security has anything come up about the 970 sending info to china servers? this is a tempting device! Fantastic phone! 2 fingerprint sensors! Amazing design! Great camera! But the price is soo much! Unfortunately...that price: Otherwise, I'm sold on this great gorgeous phone! Looks better than orignial huawei p20 pro tho. If it had a snapdragon (better custom ROM support), I would definitely consider this phone. I love the design (and notchless screen). So apart from SoC, it checks all my demands. FFS remove the porsche design branding and give it to us for a human price.